Chrichton's World: Review Five Element Ninjas a.k.a. Ren zhe wu di (1982): High quality Kung Fu flick on all levels! And ninjas. Do I really need to spell it out how awesome ninjas are? Review Five Element Ninjas a.k.a. Ren zhe wu di (1982): High quality Kung Fu flick on all levels! And ninjas. Do I really need to spell it out how awesome ninjas are? Five Element Ninjas starts out pretty conventional with two martial arts schools battling it out. Then one of the opponents, a Japanese samurai defeats one of the good guys who is so ashamed of it that he feels compelled to kill himself. In return one of the good guys acts out a little vengeance by defeating the samurai. Apparently this also weighs heavily on the samurai and feels compelled to commit suicide as well. However not before warning the good guys of what is to come. I think you can guess what that is. Yes, ninjas! The samurai was very buddy buddy with a bunch of ninjas and they feel compelled to seek out revenge for his death. Plus they want to conquer and dominate the martial arts world at the same time. Once the ninjas make their entrance the good guys are in real trouble since obviously the ninjas are very very deadly. It is pure joy to see them in action and display all the ninja goodness you would expect from them. I won't spoil it any further but let's just say that the story has a few nice twist and turns that will completely catch you off guard. To a point that I was a bit confused about the direction this film was going. Until I realized that there was still forty minutes to go and that the best was still to come. One of the things you will notice that apart from the traditional weapons they also make use of customised weapons with special functions which are surprisingly effective. Most characters in this film wield these weapons with such ease. Or at least make it seem that it's easy. But you can tell that often this is not the case at all. Only making everything so much more impressive. All the fighters involved are truly exceptionally skilled martial artists who give you their best. And you can sense that when the fights start especially later in the film where things have gone super dark. 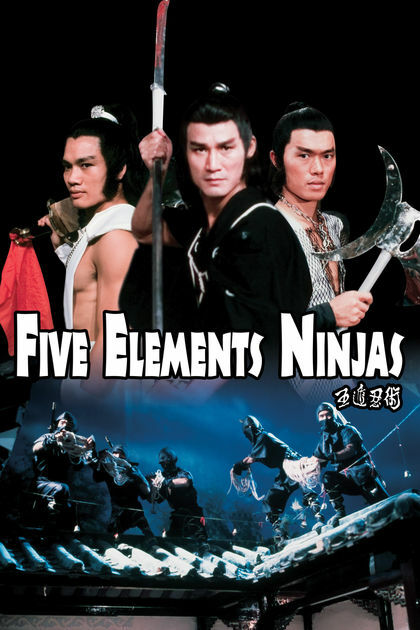 Five Elements Ninjas at one point does distract you with a sub plot that I could have done without but to be fair I was completely charmed by the actress playing Senji (Chen Pei-Hsi). She has femme fatale written all over her face. And she seemed to have a lot of fun playing her character. I am surprised to find out that she hasn't been in more films. She has that unique kind of presence stars are made of. So I have no clue what went wrong here. In any case her character is at the forefront of doom and disaster making the final acts extremely satisfying. Believe it or not there are some scenes so over the top and brutal you will laugh real hard at first but then will be overwhelmed by it's awesomeness. If it weren't for the actors and their approach to this material it easily could have become a farce. And it rarely will feel like a comedy. Actually I suddenly realize how comical some of the events might seem if you describe them. But trust me it's serious business. I am very glad I purchased the Blu ray (including DVD) of Five Elements Ninja since it will be a title I will watch from time to time. The film has all the ingredients I crave in a good martial arts and it has ninjas. I can't stress enough how awesome they are! They are people they are!